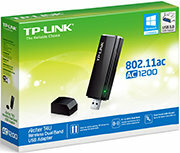 The AC1200 Dual Band Wireless USB Adapter Archer T4U allows you to connect a desktop computer or a laptop to a dual band wireless network at up to 300Mbps over 2.4GHz or 867 Mbps over 5GHz. It brings you the flexibility to select between 2.4GHz and 5GHz bands to accommodate different applications you are running. For bandwidth-intensive applications like HD video streaming and multiplayer gaming, the less crowed 5GHz band is more favorable. For simple tasks like emailing or web surfing , the traditional 2.4GHz band is good enough. 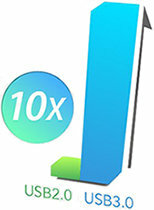 The data transfer speed of USB 3.0 port is up to 10 times the speed of USB 2.0. The Archer T4U is equipped with a USB 3.0 port to unleash the power of wireless AC and let you truly enjoy the 802.11ac high-speed experience. As a result, it is ideal for online HD video streaming, multiplayer gaming, large file transfer, downloading, and other speed-intensive applications. 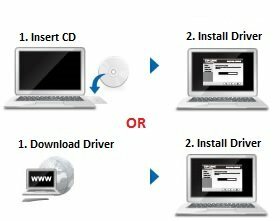 If your computer's operating system doesn't install the driver of the Archer T4U automatically after plug-in, you just need to install the driver from the bundled CD or from TP-LINK's website. 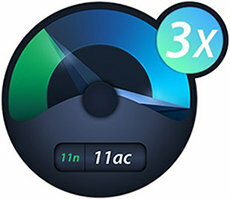 After the driver is installed, you can use the built-in wireless utility in your operating system to connect to a wireless network. If you want to use advanced features of the adapter such as Soft AP, you can install the TP-LINK utility to access those functions. 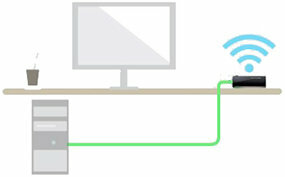 Whenever there is only wired Internet connection, you can activate the SoftAP function of the Archer T4U after installing the bundled utility software, and create a Wi-Fi hotspot for mobile devices. This feature is useful when travelling to places where there is only one cable for Internet and mutiple people have to use the Internet. The Archer T4U is equipped with an 1 meter USB 3.0 extension cable, which extends the USB connection and gives you more flexibility to place the adapter. The use of extension cable can also avoid blocking adjacent USB ports on your computer. Which Wireless Adapter is Right for Me?